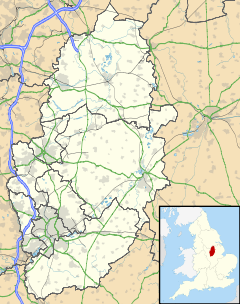 Aslockton is an English village and civil parish twelve miles (19.3 km) east of Nottingham and two miles (3.2 km) east of Bingham, on the north bank of the River Smite opposite Whatton-in-the-Vale. The parish is also adjacent to Bingham, Scarrington, Thoroton and Orston. It lies in the Rushcliffe borough of Nottinghamshire. The population was recorded as 1,742 in the 2011 census. Appearing as Aslachetone in the Domesday survey of 1086; the place name seems to contain an Old Norse personal name Aslakr + tūn (Old English) meaning an enclosure, a farmstead, a village, an estate, etc., so "Farm or settlement of a man called Aslakr". There are 19 such place names (a Scandinavian personal name followed by tūn ) in Nottinghamshire, all of them in the Domesday survey, and all apparently ancient villages. All that remains of the 12th-century Aslockton Castle are some the earthworks: the motte, called Cranmer's Mound, stands about 16 feet (5 m) high. Thomas Cranmer, Archbishop of Canterbury 1533–1553, was born in Aslockton and lived until the age of 14 in his parents' cottage, which still stands in Abbey Lane. The Archbishop Cranmer Church of England Primary School (an academy since 2014, having opened in 1968), the Cranmer Pre-School, and the local social facility, the Thomas Cranmer Centre, are named in his honour. (For secondary education, Toot Hill School in Bingham has a sixth form and academy status.) Aslockton originally had its own Holy Trinity Chapel, a peculiar under the collegiate church of Southwell Minster rather than the diocesan bishop, but this became ruined and was incorporated into a private house. Some remains of it can still be seen. Cranmer and his father worshiped at the Church of St John of Beverley, Whatton. He has also given his name to a local prospect mound. The population of Aslockton was 171 in 1801, 273 in 1821, and 289 in 1831. The village had a population of 363 in 1936. The land for Aslockton Cemetery was purchased in 1869, at which time the only place of worship in the village was a Methodist chapel, which has since been converted into flats. The present Grade II listed St Thomas's Church was designed by the architect Sir Reginald Blomfield and erected in 1890–1892 in memory of a former vicar of Whatton, Thomas K. Hall, who drowned in February 1890 as RMS Quetta was wrecked off Queensland on her way to Thursday Island. His mother, Mrs Sophia E. Hall, paid for the church. The Quetta window on the north wall depicting the shipwreck was designed by Michael Stokes in 2002, as was the east window, dedicated to Cranmer, which has Jesus showing his hands to Doubting Thomas. The church has a single bell in a bell cote at the west end. The parish forms part of the Cranmer group, with Hawksworth, Scarrington, Thoroton, Whatton and Orston. The incumbent is Rev. Bryony Wood. The vicarage is in Aslockton. Despite the village's small size, it had two pubs until recently: the Old Greyhound and the Cranmer Arms. The Old Greyhound closed in May 2007, and the new owners have submitted a planning application  to turn the building into a restaurant. The village also has a small shop, which includes a post office and a dry-cleaning service. Aslockton Hall contains a nursing and residential home for the elderly. The Aslockton windmill and bake house were situated on Mill Lane (grid reference SK739408). The mill was a wooden postmill, weatherboarded, on a brick roundhouse, with four single patent sails. The miller and baker in 1864 was Job Heathcote. The village railway station has regular services to Nottingham, Spalding and Skegness. A bus service operates to Bingham and Bottesford for onward bus connections. The local community quarterly newsletter, delivered free to every house, is called The Voice. Whatton and Aslockton have a joint cricket club said to date back before 1815. It has two senior teams playing in the South Nottinghamshire Cricket League and a colts team playing in the Newark Under 15s Premiership League. Aslockton Cranmer Football Club fields a variety of teams for adults and youngsters. There is also a tennis club, and table tennis teams at the Thomas Cranmer Centre. Thomas Cranmer (1489–1556), Archbishop of Canterbury, leader and martyr of the English Reformation, born in Aslockton. John Robertson (born 1953), the Scotland and Nottingham Forest footballer, took over the Old Greyhound pub for some years from 1986. Chris Urbanowicz, rock musician, was born in Aslockton in 1981. ^ J. Gover, A. Mawer & F. M. Stenton (eds. ), Place Names of Nottinghamshire (Cambridge, 1940), p. 219; A. D. Mills, Dictionary of English Place-Names (Oxford, 2002), p. 22; E. Ekwall, Concise Oxford Dictionary of English Place-names (Oxford, 1960), p. 16; V. Watts, Cambridge Dictionary of English Place-names (Cambridge, 2002), p. 23. ^ J. Gover et al, p. xviii. ^ "Aslockton Castle". CastleUK. Archived from the original on 3 November 2007. Retrieved 2 December 2007. ^ Toot Hill School Retrieved 7 February 2016. ^ A Vision of Britain. Retrieved 4 January 2014. ^ Rushcliffe Conservation Area.Retrieved 4 January 2014.; Cranmer Local History Group. Retrieved 4 January 2014. Archived 5 January 2014 at the Wayback Machine Whatton in 1792. ^ The Nottinghamshire Village Book. Compiled from materials submitted by Women's Institutes in the County (Newbury/Newark: Countryside Books/NFWI), p. 11. ^ Cranmer Local History Group.. Retrieved 4 January 2014. ^ Cranmer Local History Group. Retrieved 4 January 2014. [permanent dead link] The page gives details of the 1936 entry in Kelly's Directory. ^ Cranmer Local History Group. Retrieved 4 January 2014. Archived 5 January 2014 at the Wayback Machine Aslockton Cemetery. ^ Nikolaus Pevsner: The Buildings of England:Nottinghamshire (Harmondsworth, Middx: Penguin, 1979), p. 59. ^ Southwell & Nottingham Church History Project. Retrieved 4 January 2014. ^ A Short Guide to the Parish Churches of the Bingham Rural Deanery, ed. J. Pickworth-Hutchinson. (Bingham: Deanery Chapter, 1963). ^ Aslockton Online. Retrieved 5 January 2014. ^ Aslockton and Whatton Local History Group (N.D.), The Changing Village, Nottingham, p. 47. ^ Cranmer Local History Digest, September 2005, p. 4. Retrieved 5 January 2014. ^ Grantham Matters Retrieved 5 September 2016. Wikimedia Commons has media related to Aslockton. A short, rounded, somewhat critical account of the life of Cranmer: Retrieved 5 January 2014.